This tutorial will show you how to set up MediaStreamer on Windows. Click the Start button and type “ncpa.cpl“, or press the Windows key + R on your keyboard and type “ncpa.cpl“. 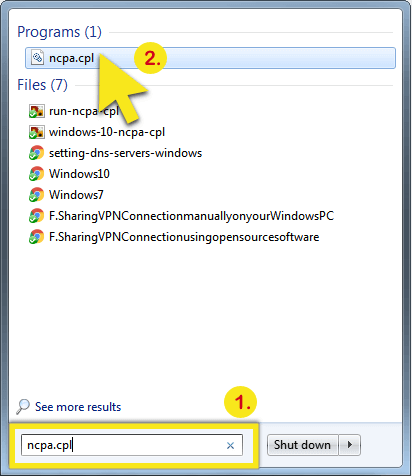 When you see ncpa.cpl in the listed programs, click on it to open the Network Connections window. In the Network Connections window, select your active Internet connection. If you are connected via a LAN cable, select the appropriate Local Area Connection. If you are connected via Wi-Fi, select the appropriate Wi-Fi connection. Right-click on the icon and select Properties. 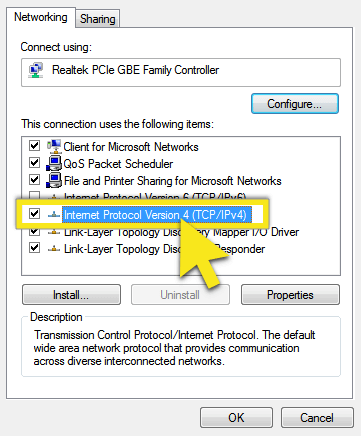 In the Local Area Connection/Wi-Fi Properties menu, double-click on Internet Protocol Version 4 (TCP/IPv4). Make sure that Internet Protocol Version 6 (TCP/IPv6) is unchecked. 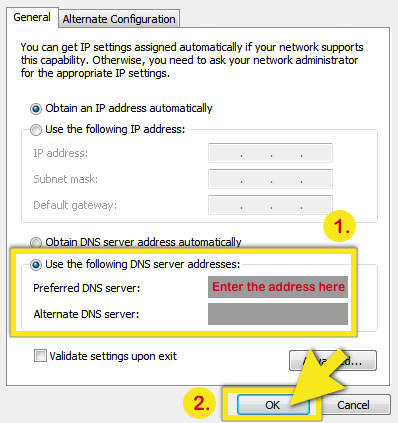 In the “General” tab, select Use the following DNS server addresses and enter ExpressVPN’s MediaStreamer DNS address (you only need to enter the Preferred DNS server address). To find ExpressVPN’s MediaStreamer DNS address, sign in to the ExpressVPN website, click on Set Up ExpressVPN on the Active Subscriptions page, then copy the address under the MediaStreamer section.